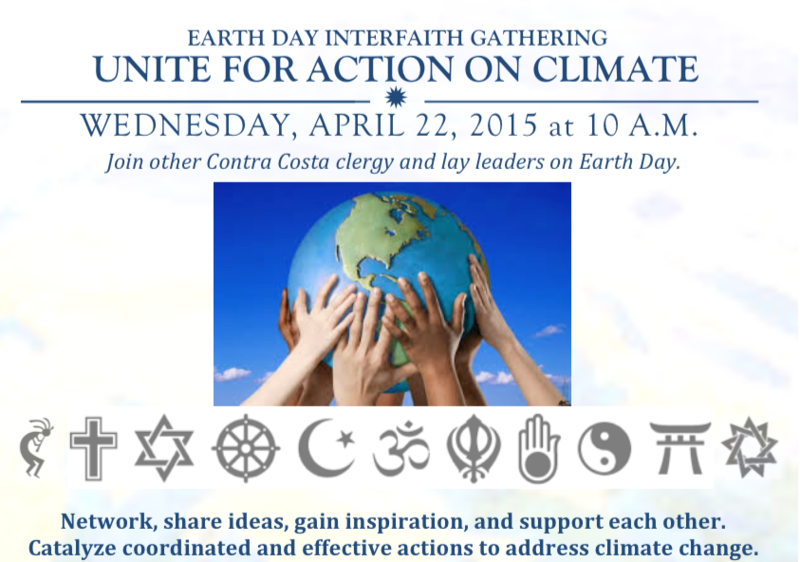 The Interfaith Climate Action Network of Contra Costa County was launched on Earth Day 2015 in Lafayette. 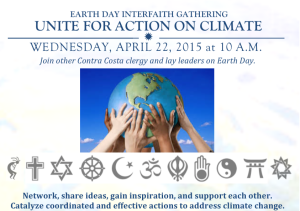 Organized and led by CIPL member congregations in the county, more than 100 people shared in the following commitment. We pledge allegiance to the Earth and all life upon it. We pledge to care for this portion upon which we now dwell from the peak of Mt. Diablo to the waters of San Pablo Bay, Los Vaqueros and the Delta of the San Joaquin & Sacramento Rivers. We pledge to care for all the life these ecosystems and these watersheds support. We pledge to learn and work together to confront climate change and its impacts. We pledge to stand in solidarity with all people who suffer from these impacts and to challenge injustice. We pledge to reduce our carbon footprints, conserve water, and advocate for a renewable energy future. Just as drops of water, when combined, can create a powerful force, our united actions can surpass what we can accomplish alone. One planet, Earth, in our care, irreplaceable, with sustenance and respect for all. ICAN leaders gather regularly to learn, encourage, inspire and challenge each other.